This site Celebrates the history of the Balaban and Katz Theater Corporation. 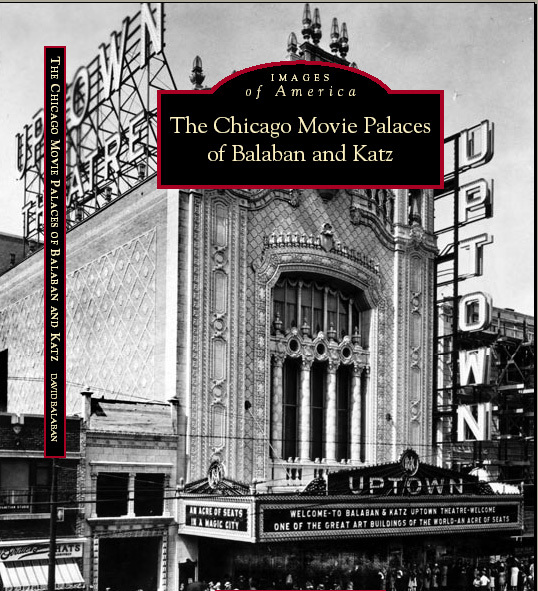 Buy the first book from the Balaban and Katz Historical Foundation entitled," The Chicago Movie Palaces of Balaban and Katz." You may order the book .at www.buy.com, www.amazon.com, www.walmart.com or other fine retailers.Simply put the search word,"Balaban" in and you will see the listing. Order now! We are working on an extremely detailed Balaban and Katz television documentary featuring Hollywood personalities, former Balaban and Katz employees and family members .....to be released soon. Stay tuned for details! The Balaban and Katz Theater Corporation perfected the movie "palace"concept in Chicago, creating an extremely popular past time that contributed greatly to Chicago's cultural identity. The Balabans started in the movie theater business in 1908 by leasing the 100-seat Kedzie Nickelodeon on Kedzie Avenue. Balaban brothers Barney and A. J dreamed of operating 5000 seat Movie Palaces so, in 1916, they joined family friends Sam and Morris Katz to form the Balaban and Katz Theater Corporation. Their mission was to offer an un- rivaled theater going experience with the finest live performances and service, They built hundreds of ornate theaters, such as the Chicago, the Uptown, and the Oriental Theaters, filling them with fine furnishings, antiques, and artwork. Balaban and Katz produced live stage shows between the movies, with the likes of Bob Hope, Louis Armstrong, and Benny Goodman. Sadly, only a few of these gorgeous theaters still stand today. "The Chicago Movie Palaces of Balaban and Katz" traces the company's history through vintage images contributed by the Chicago Historical Society, the Theater Historical Society of America, the Balaban and Katz Historical Foundation, and the Chicago Transit Authority. Author, David Balaban, named after his grandfather, one of the five Balaban brothers who ran Balaban and Katz, grew up on stories of his grandfather and uncles' movie theaters. David's grandfather managed the Uptown, Riviera and Norshore Theaters in the 1920's and was Director of Theater Operations for B and K when he died suddenly in 1949. In addition to the book, Mr. Balaban is producing a documentary for television about the Uptown Theater and the Balaban and Katz Company as a whole.